Take a look at us know. As we approach 7 weeks of age, we are quickly changing shape and personality. From being very sleepy to bundles of fun. Please Sir can i have some more! Optigen is the name of an company in America which have recently managed to find and isolate the gene that causes hereditary diasess in dogs, one of the most promanent being pracd-PRA. This means that even in pups, it is now 100% possible to tell if the pup is likely to suffer form pracd-PRA later on in life. The DNA test can be done either from a blood sample or mouth swap from the dog and you’ll recieve the result within 2-6 weeks. Normal \ Clear The dog doesn’t have the gene and will never get pracd-PRA nor is it not possible for the dog to pass on pracd-PRA to any of it’s offspring. Carrier The dog carries one pracd-PRA gene and will never develop pracd-PRA but will be able to pass on the gene to its offspring. Affected The dog has pracd-PRA and is very likely to go blind. This also means that the dogs offspring will be either ‘carrier’ or ‘affected’. A dog needs to have the gene twice in order to be ‘affected’. 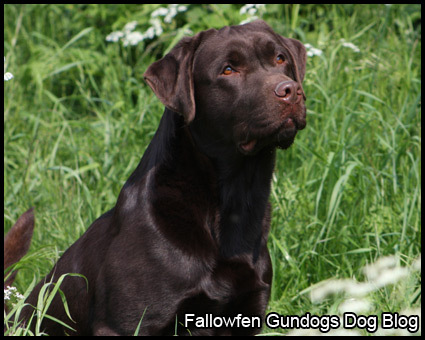 To find out of other tests and range of breeds they are suitable for click here. The British Veterinary Association have a hereditary eye disease screening programme. The scoring system categorises the eyes as either ‘affected’ or ‘unaffected’ for a range of conditions. The test is only indicative of the state of the eyes at the time of screening. Some conditions may show no clinical signs until later on in life, so dogs used for breeding should be tested annually. To read more on the eye testing click here. 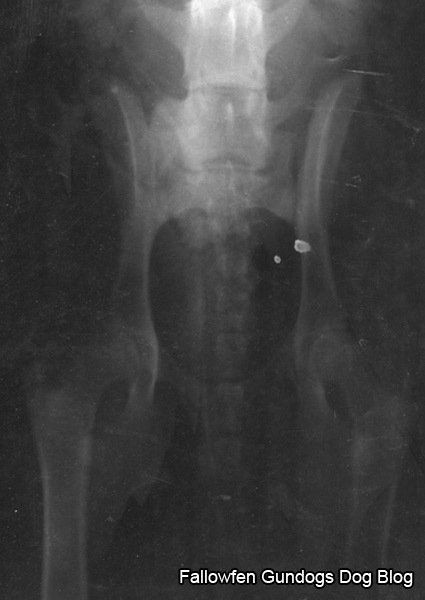 The lower the score, the less the degree of dysplasia present. 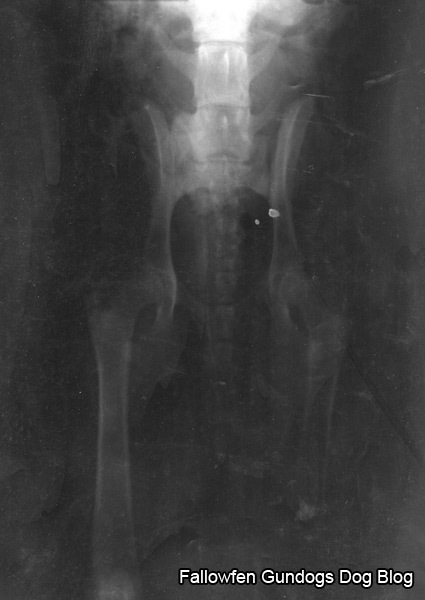 The minimum (best) score for each hip is zero and the maximum (worst) is 53, giving a range for the total of 0 to 106. To find out the average score of your breed click here. Haddeo Thesfus Of Fallowfen “Flint” Wins! 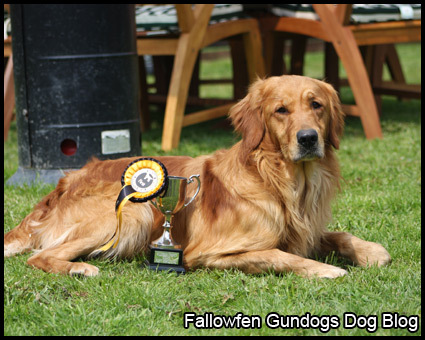 The weekend of the 10th of May we traveled down to Ware in Hertfordshire to run Flint, our Golden Retriever Stud, in a Golden Retriever special puppy competition held by Eastern Counties Golden Retriever Club. It was a record for the Golden Retriever Club as entries hit an all time high. There were three individual working tests to test the working ability of the Goldie’s. The 1st test was to test steadiness of the lead walking to heel with a marked retrieve along side gunfire. The 2nd test was a walk up to heel followed by a double mark. The 3rd and final test was a marked retrieve in water. I think the hardest test of the day was dealing with the immense heat. At the end of tests the judges gathered to discuss the working ability of the Golden retrievers they had seen, a few minuintes later the results were announced……… 1st place of the Special Puppy Golden Retriever Test goes to number 7, Mr and Mrs Hutchison with Haddeo Thesfus Of Fallowfen “Flint”. We were over joyed and hope his success will continue. The Novia Scotia Duck Tolling retriever is an adaptable breed, making it increasingly popular. 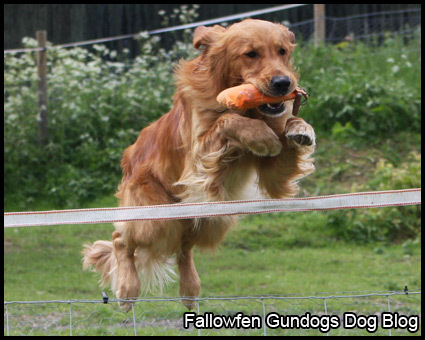 I am sure that you can count on the fingers of one hand the number of professional gundog trainers who specialise in Nova Scotia Duck Tolling retrievers. On second thought, I think it’s more likely you can count on one finger the number of such specialists. 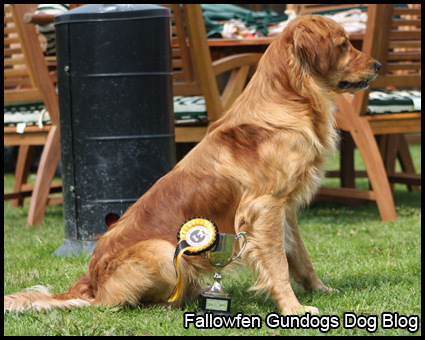 If you want help training your Toller to the gun, then Phillip Hutchinson is the man to turn to. 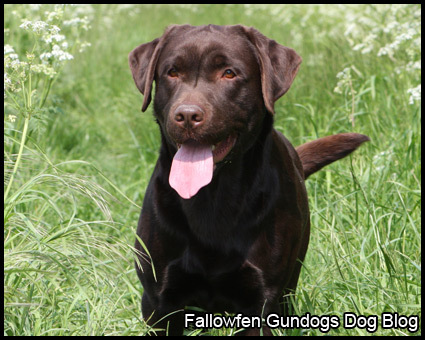 Though Phillip owns both working Springers and Labradors and has experience training most other breeds of gundogs, the foxy-looking North American retrievers are what he has decided to concentrate on. Tollers are a fairly new import to this country, only arriving here in 1988 and relatively few are used in the shooting field. 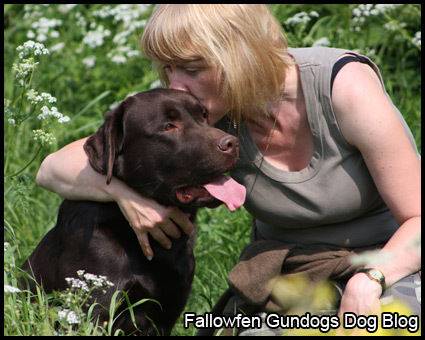 Summer group training for steadiness ready for picking up with more than one dog this coming winter. Includes three Labrador’s, two Nova Scotia Duck Tolling Retriever’s, one Golden Retriever and one Cocker Spaniel. 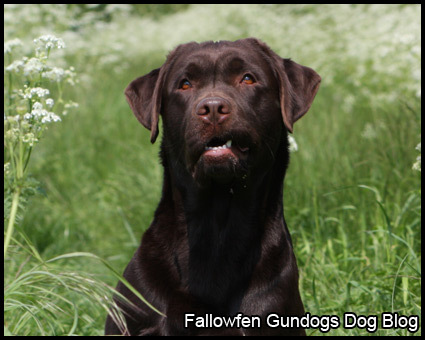 Casper is a Chocolate Labrador and a new addition to our kennels, he has been with us about four weeks and has begun his new life as a working gundog. As you will see he’s really good and really enjoys it! Please welcome our latest Gundog Stud ‘Casper! Casper is a very kind outgoing labrador, rich in colour. He has a strong athletic build with soft temperament. Casper was born and breed in a family enviornment. Casper is showing fantastic working ability and will be a strong part of the picking up team this winter. You can see more of Casper here.